You are here: Home / Tori's Corner / Contests and Giveaways / Brinner Week Giveaway! THIS CONTEST IS CLOSED – PLEASE DO NOT COMMENT. Christina’s comment was chosen from an online randomizer. Extra entries were awarded to those who “tweeted” and Facebooked. To those who didn’t win, stay tuned, another giveaway will be coming up very soon! My family loves having breakfast for dinner. We do it a couple of times a month because it’s fun, easy, and lighter than a big heavy dinner meal. I thought it would be fun to share some of my favorite brinner recipes before we head into our Passover holiday planning. I’ll be sharing some brand new brinner recipes, as well as favorite dishes from the archives. To celebrate Brinner Week, I’m holding a fun breakfast-themed giveaway! Comment on this post and let me know what your favorite brinner dish is. Share the link on Facebook for an additional entry, and Tweet it for another entry by clicking the share buttons at the end of this post– that means you can enter up to three times! You will be subscribed to my website newsletter with free recipes, fun food history posts, and Shiksa in the Kitchen news. 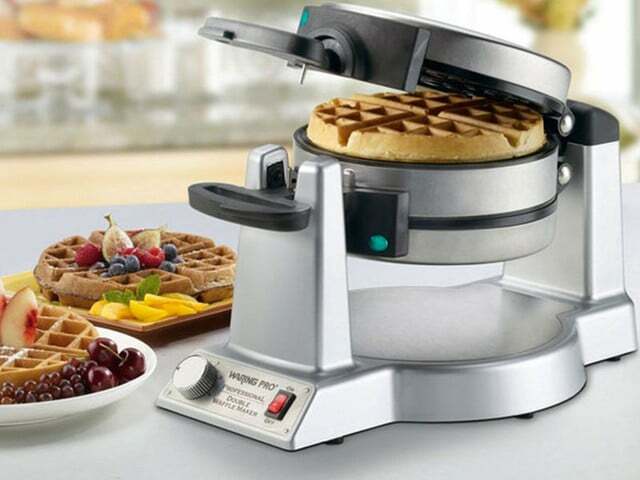 You will also be automatically entered to win this gorgeous Waring Pro Double Belgian Waffle Maker! This waffle maker is a real beauty. It cooks 2 large Belgian waffles at a time so you can quickly feed a hungry crowd. It’s a quality waffle iron (retail value $99.95) that produces gorgeous, golden waffles that are crisp on the outside and fluffy on the inside. Perfect for making brinner! – Comment below and let me know what your favorite brinner dish is. This will count as your first official entry, and you don’t have to do anything more if you don’t want to. You will be subscribed to my website newsletter with free recipes and Shiksa in the Kitchen news. Be sure to use a valid email address so I can contact you if you win! – You can also share this post on Facebook by clicking the Facebook button below– this will give you another entry in the contest. Let me know you shared in your comment so I can count the extra entry. – Share this post on Twitter by clicking the “Retweet” button below for another entry– this will give you another entry in the contest. Let me know you shared in your comment so I can count your extra entry. The contest ends at the end of Brinner Week at 3:00pm Pacific Time on Friday. The winner will chosen via a computerized randomizer, and will be announced here on Monday March 19; they will also be notified via email. The prize will be shipped via standard shipping the following week. Good luck! I would say homemade quiche with spinach, onion, swiss, etc. and a smoothie although waffles are a close second smothered in fruit and whipped cream. My favorite is pancakes and bacon and eggs. challah french toast with fresh strawberries & morningstar veggie bacon! Matzo Brei or pancakes are our favorite Brinner! My favorite brinner is pancakes with pure maple syrup, crispy bacon, and strong hot Starbucks coffee. Perfect! My absolute favorite brinner is tortillas and eggs, and it couldn’t be simpler to make. Just put a skillet over medium or medium-high heat with a fairly liberal coating of oil, sweat some chopped onions, tear some tortillas and throw them into the skillet to fry, and, once they seem crisp, crack a few eggs into the mix. This is great with chorizo, too, and of course you have to have salsa to finish it off at the table! French toast, pancakes, or waffles – any one will do. We just had Brinner last night! Bagels, lox and cream cheese, and scrambled eggs. Sometimes we saute onions and mushrooms or salami and put in the eggs… yum! But if I had one of these puppies, it would take Brinner to a whole new level! Blueberry waffles made with whole wheat flour are our favorite. Definitely pancakes! Haven’t had any in forever, now craving them! eggs sausage and tons of toast. and of course breakfast potatoes! Favorite brinner meal (where I pretend that we aren’t actually eating breakfast for dinner) is to scramble eggs with chives and serve them with steamed artichokes and a homemade bread. We love French toast fro brinner because it can be savory (dipped in over easy eggs!) or sweet (powdered sugar and strawberries!). most definitely belgian waffles! oh, and my father’s scrambled eggs – won’t eat any other scrambled eggs! I have this breakfast casserole I can make for dinner — sausage crumbles, Egg Beaters, shredded potatoes, light cheese and/or light chicken noodle soup. But we love waffles so we’d love this! My brinner guests love pancakes! I do a “bar” with different sauces & add-ins so everyone gets just what they’re in the mood for that night! My family loves big breakfasts, but the DH is not a fan of Brinner…so when he has a game or is on a business trip the kids and I take serious advantage of it…Scrambled cheesy eggs, bacon, grits, and pancakes n syrup for dessert (waffles would be great here too) and homemade fluffy golden southern style buttermilk biscuits. 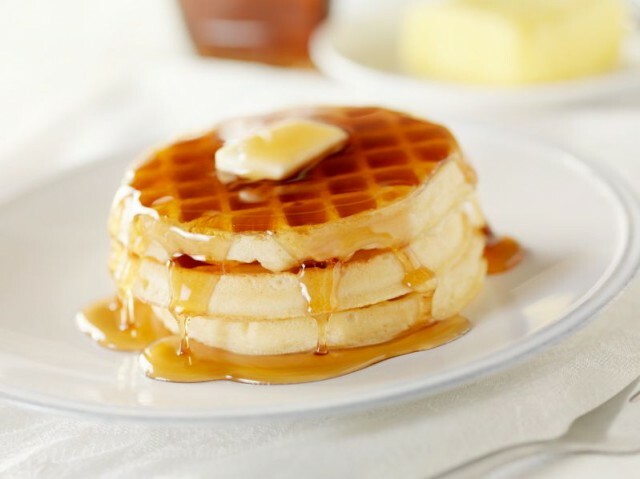 We love pancakes and coffee for dinner – especially on rainy nights…..
Pancakes – whole wheat sourdough, usually, often with fried eggs or maple syrup, but once in a while with gravy if we have some leftover from a previous meal. My favorite “brinner” meal is eggs. Eggs in omelettes, quiches, egg salad…. Yummy, easy and a good source of protein! We love pancakes, challah french toast, and strata! And of course waffles! Shared on FB, too. Lox, eggs, onions all scrambled up and served to my by my sweetie. He also makes a mean jelly omlete during Pesach. i love pancakes any time of day! this one is hard i have two favorites. egg in the bread (egg in basket, toad in the hole) what ever you prefer to call it with hashbrowns and bacon. My other favorite it taylor ham egg and cheese sandwich on a kaiser roll. I love omelettes and fried potatoes for BRINNER! Tori this is exciting. I am so tired I can’t see straight though, is it open to us Cancuks? I’d quite likely so a banana nutella waffle if I had this. I love breakfast! I’m a big fan of eggs, bacon and pancakes. Growing up, it was chorizo and eggs. Crepes. While they are more work than just pancakes, they have great potential to fill every desire you could want in a brinner. They can be uber-sweet or remarkably savory and still be a breakfast dish. They can be simple or complex and as light or heavy as you want. But most importantly, they can satisfy anyone’s brinner cravings and then be perfect for dessert (they even work well with aperitifs). What a fun giveaway! I LOVE brinner! I make something called “ugly eggs”. It basically is breakfast with eggs cracked over them and scrambled into an ugly, delicious mess! I love making my dad’s french toast! We love brenner too! But we call it B2! I just shared the link on my FB page. Our favorite ‘Brinner’ meal is scrambled eggs, potatoes, and whatever fresh veggie that come out of the garden. But I have to say – Sunday morning waffles are our favorite meal of the week!! Lox, cream cheese, a slice of red onion and tomato, on a poppy seed bagel!!! Breakfast anytime, but I love waffles with any fruit in season smothered in whip cream. No syrup required. Pancakes, brown sugar basil bacon, fruit salad and orange creamsicle smoothies! My fave is omelets, you can make them so savory and healthy with different fillings! My children adore breakfast for dinner….we have it on the calendar at least twice a month. I think the favorite is pancakes and turkey sausage. My youngest adores waffles, so if we won the waffle iron she would be over the moon! Thanks for your blog Tori! I am so glad I went through the recipes, because I found some new recipes to try for Passover this year! I am sure they will be wonderful!! Pancakes and sausage. But it would be waffles if I had a cool waffle iron, lol. I could eat pancakes all the time. We love omelettes and bacon for brinner! Veggie skillets with toast and strawberry jam on the side. So delicious!